1930s aviation board game based on the R.A.F. as a career path. Lovely large tri-fold playing board that opens to approximately 75 x 50cm. 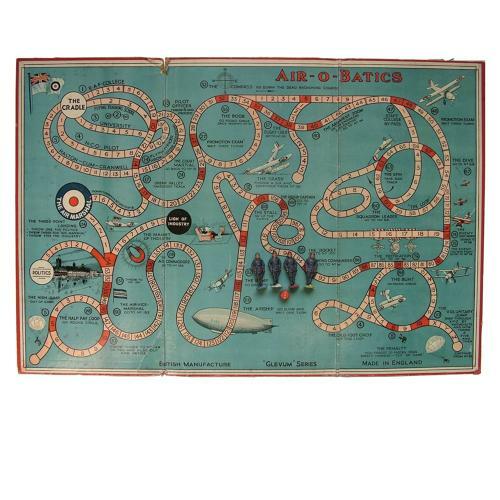 This is illustrated with different ways to obtain a commission in the RAF and proceed via promotion to end up as Air Marshall and winner of the game. Players can begin through the RAF College (Cranwell), via a short service commission through Flying Training School, Commission with Seniority Flying Officer through University, Other ranks trained as Airman Pilots promoted to commissioned ranks or as an Aircraft Apprentice (Halton) selected to pass the course at the RAF College (Cranwell). This is essentially a 'throw the dice & move' game taking the consequences of the squares upon which you land - promotions, court martials, crashes, loops and spins, shooting down the enemy, medals and so on. The board shows wear and use with some soiling and creases but remains good and bright. Also comes with the original colour coded solid cast metal playing pieces in the form of miniature airmen. No instructions but these can be found online should you wish to play. We originally sold this to a client in 2006 and recently purchased it back. A rare time capsule from the days prior to WW2 and an excellent display piece. Stock code M23275.